Mindy Cox, is a Certified Professional Dog Trainer, a Professional Member of the International Association of Animal Behavior Consultants (IAABC), a Certified Fear Free Professional, and has been working with dogs for decades. She graduated with a bachelor’s degree in Animal Science from Cornell University and pursued her master’s degree in veterinary anatomy from the University of Georgia College of Veterinary Medicine. Mindy was an animal hospital administrator for over thirty years in a veterinary practice she co-owned with her husband, and in that capacity had been instrumental in starting programs in pet therapy, puppy kindergarten, and obedience and behavior. She is currently applying all of her energies to helping dog owners create the best possible partnership with their dog. 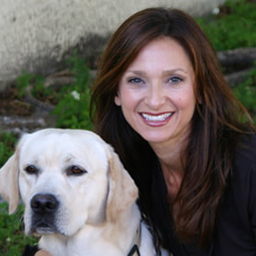 Mindy is the Training Director and owner of Lucky Dog Sports Club in Jupiter, FL. She helps dog owners with a multitude of training and behavior issues, both in group and private classes. She is also a founder and instructor at Dog Nerds, LLC, an educational company that creates online courses to help owners solve dog behavior issues. Learn more about Dog Nerds. Cheryl is a graduate of The Academy for Dog Trainers run by Jean Donaldson. The academy offers one of the most rigorous, advanced programs in dog behavior and training in the world. It is regarded by many as the “Harvard of dog training”. Cheryl also holds a Masters Degree in Educational Leadership. Cheryl’s classes at Lucky Dog are fun and creative. When she is not teaching classes, she works as a Veterinary Behavior Technician at Florida Veterinary Behavior Service with Dr. Lisa Radosta. 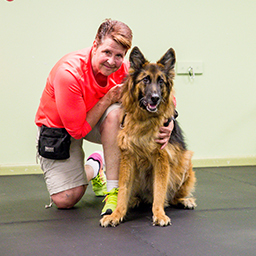 Cheryl has participated in many obedience classes and seminars Lucky Dog to gain knowledge to help her understand and better handle her “challenging” German Shepherd Seele. She also regularly attends outside dog training and behavior seminars to increase her knowledge. She is currently participating in tracking as well as and Nose Work where she has certified her dog on all 3 Nose Work odors, sweet birch, anise, and cloves. She has also competed in a NW1 trial. In addition to German Shepherd Seele, Cheryl shares her home with Buster, an adorable one-eyed Pekingese, and Chenille, her boisterous Cockatoo. 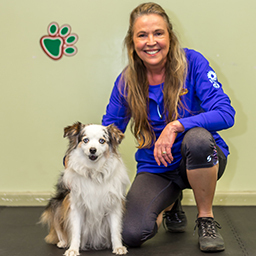 As the sport of agility evolves, Anna Strait has the tools and passion to train your team to be successful competitors, or just enjoy and share the sport with your four-legged companion. She is a very positive and motivational person. Anna was bitten by the agility bug from the moment she stepped into her first class at Lucky Dog in 2009. At her first competition at DACOF (Dog Agility Competition of Florida) in 2011 on the Lucky Dog team, she and her mini Austalian Shepherd Violet took 3rd Place in Jumpers. At DACOF 2012 she was part of the Lucky Dog Team that finished in 2nd Place. DACOF 2013 the Lucky Dog Team finished in 5th Place; Anna won the 2nd Place in T2B, and 3rd Place in Jumpers. In December 2014, Anna & Violet earned their first MACH (Master Agility Championship) and since then have earned additional MACHs. Violet is in the first place standing of her breed in the nation and will compete at the 2016 AKC Agility Invitationals. As a student of agility, Anna has attended seminars with top ranked international handlers such as Jen Crank, Karen Holik, Rhonda Koeske, Tracy Sklenar, Anne Braue, and Barb Davis. Anna is a successful and active competitor at the Masters level with AKC and USDAA. Competing frequently puts her at the heartbeat of agility and as such is able to recognize new course challenges to inject continued excitement into her classes. Barb started working with dogs at the age of 15, and finished many champions in conformation and obtained dozens of titles in obedience including OTCH. Her first breed was Wire Fox Terriers and she now is owned by shelties and border collies. In 1995 she began competing in agility and in 1999 won her first national championship. She now has 9 national championship titles in 3 different venues and with 5 different dogs. She has competed internationally since 2000, 9 times with the AKC Agility World Team and multiple times with the European Open team. She has twice placed second at the World Championships. She currently has 47 MACH titles on her many great dogs she has had over the years. Barb has a Masters degree in Mathematics Education and taught math at a community college for 15 years. In 2007 she started her own business, Stride Ahead Agility LLC, and began teaching agility full time. Barb has a passion for teaching and hopes her students will work hard to become the best teammate possible for their dog. Barb has worked with dozens of the best instructors from all over the world, many of them connected to the One Mind Dog system and she also occasionally traveled to Europe to train under other innovative instructors. 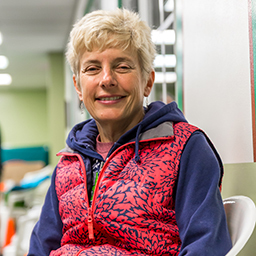 Barb has a passion for being on the cutting-edge of agility and loves passing on the information she learns that she thinks will most help her students. Barb’s many years of working with dogs, and her analytic skills developed from her mathematics training, combined to create a handling system of methods natural for the dog, as well as help her develop an understanding and reason for every bit of communication relayed to the dog. She enjoys working with students to help them develop enough skill that they understand “why” they are doing each maneuver and being able to analyze for themselves when and why the dog misunderstands. This develops the harmony you sometimes see in an agility run where the dog and handler just look like poetry in motion. Barb currently has 4 dogs, a sheltie “Rock-It” who is the oldest, is twice an AKC National Champion, a USDAA National Champion and an AAC National Champion(Canada). He won 7th at the Agility World Championship with the AKC US World Team and is an ADCH, MACH11 & PACH 4. His son “Skecher” is twice an AKC National Champion, a 3 time AKC Agility World. 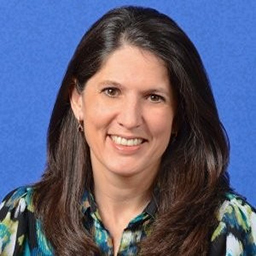 Diana is an actively practicing doctor of physical therapy. She manages and treats (human) patients at Manus Physical Therapy, Inc. in Jupiter. She has earned a certification in Functional Manual Therapy and is continuing her studies in Neural and Visceral Mobilization. Diana grew up on a farm and has always had dogs in her life. Currently she lives with Mistic who enjoys frisbee, has the Rally Novice title and CGC; Stormy who has her Canine Good Citizen (CGC) title and has been TDI, therapy dog certified; Ginger who has CGC, Rally Excellent, Companion Dog (CD), Open Agility Jumpers, Novice Standard Agility, and Novice Fast titles; and Leo who has the NACSW NW2 (nosework) title and the Rally Novice title. Leo also has the pretest certificate for tracking dog (TD). All four have been introduced to obedience, frisbee, herding, agility, nosework, tracking, and rally. Diana enjoys finding the sport each dog loves in order to bring out the best in each of them. When her working dogs have fun, they are more confident and happy. Her training methods utilize shaping, clicker, positive reinforcement, praise, and drills built for successful motor skill mastery. Her physical therapy background has trained a keen eye for body language and position which are critical for agility and handy for the other sports as well. Diana has trained under masterful agility competitors including Barb Davis, Chris Seiter, Kris Tucci, and Anna Strait and utilizes techniques from Leerburg and Susan Garrett. She enjoys sharing her passion for dog training with her students. 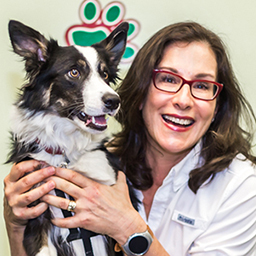 Dr. Radosta has been helping owners positively alter their pet’s behavior for many years, first as a dog trainer druing her college years, later as a veterinary behavior consultant and currently as a board certified veterinary behaviorist. In 2006, she completed a three-year residency in Behavioral Medicine at the Matthew J. Ryan Veterinary Hospital of the University of Pennsylvania. She received multiple research awards during her residency. We are fortunate and honored to have her teaching here at Lucky Dog. Visit her website to find out more about her practice or to schedule a private consultation. Kimberly Chase. Certified: Limited Range of Motion, Fitness Trainer, Human and K9 Fitness, Advanced Pilates, Aquatic Fitness, Cycling, Speed and Agility Coach, Paramedic, B.A. Kimber has been involved in the fitness and medical world teaching and training since high school. She operates a fitness business in Delray Beach, Fl. and the surrounding areas. For the past 17 years she has also been involved in dog sports including agility and obedience with several breeds, earning various titles and championships. Kimber has also had many local, regional and national agility successes. 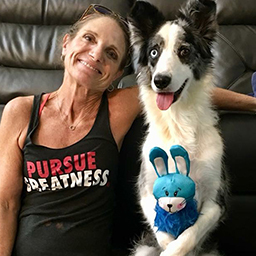 Most recently she and her border collie “Hurley” have been selected for the IFCS USA World team 2019. As a human coach she works with many agility competitors online and in person while instructing local clients and teaching various corporate and private group fitness classes. She also contributes dog and fitness related articles monthly to The 2019 Agility Challenge.